Picture this. Seven young women and three instructors stand in the water with dip nets and orange buckets in hand. The day is sunny and getting warm, early April in Mississippi. Some girls wear jackets while others sport T-shirts with jackets tied at their waists. Even the girls who forgot their water boots have sacrificed their tennis shoes for a chance to explore the fish and insects in the stream’s ecosystem. Some have been working upstream where a second stream joins the water flow. Dr. Scott Knight holds a USGS water velocity tool and one participant, feet in the water, listens carefully to headphones for the clicks to measure the water velocity in that area of the stream. The electrofishing pack, looking very similar to a Ghostbusters outfit, leans against a tree just past the edge of the picture. The students and teachers look wet but happy as they stand in colorful relief against the brown of the bank and the green of the trees. The image is one of exploration, of inquiry paused for a snapshot in time. This is what a field experience looks like. This is student-driven inquiry. 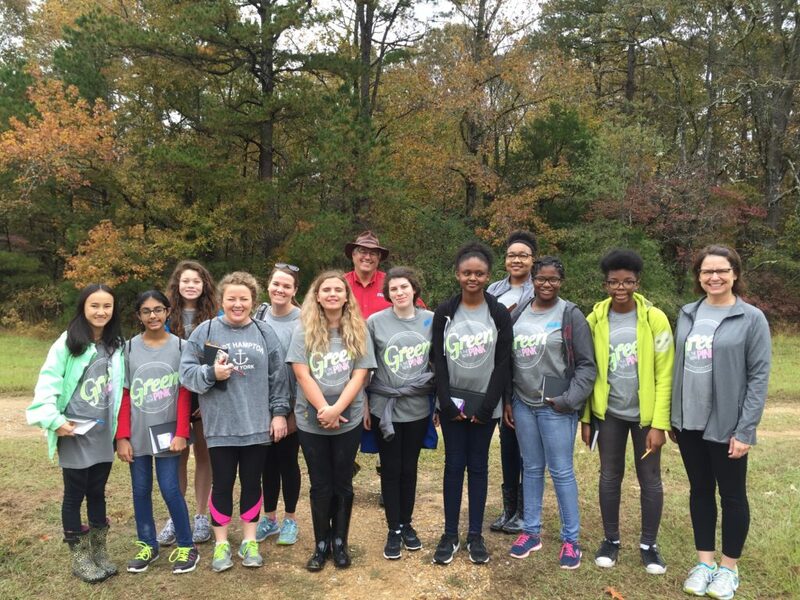 The Green Is the New Pink: Young Women Environmentalists in Action experience centered on exploring environmental issues in a local context. The program was funded by an LRNG Innovators Challenge grant that invited educators to imagine engaging ways to help young women explore their interests, thereby igniting a passion that can lead to college, to a career, or to having a positive impact on their community. 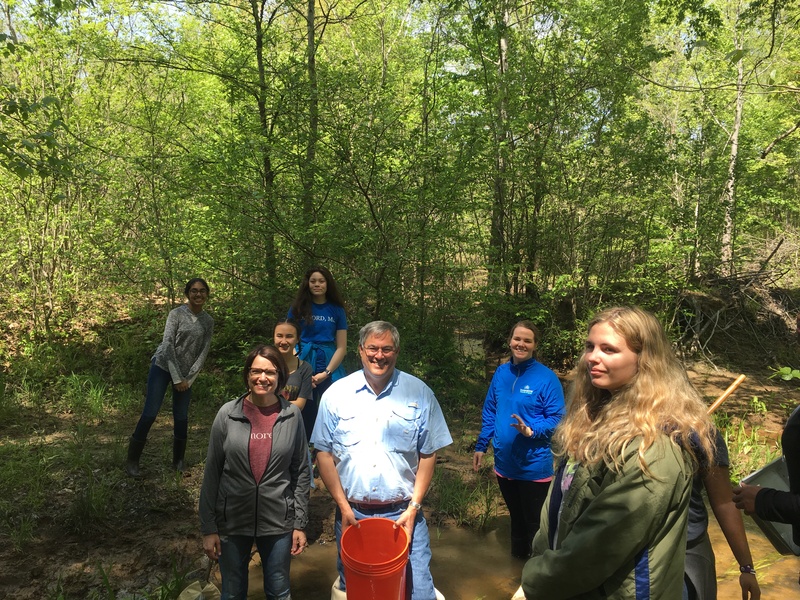 The program consisted of four Saturdays of field experiences focusing on citizen scientist strategies as well as more advanced environmental lessons. We introduced real-world research strategies with a special focus on data collection, data exploration, beginning analysis and interpretation, and drawing conclusions. Twelve young scientists in grade 8-11, two science teachers, one English Language Arts teacher consultant, one field station director, and I, The University of Mississippi Writing Project Director, worked collaboratively in this student-driven exploration. Two days, early fall and winter, were spent at Strawberry Plains Audubon Center just north of Oxford, Mississippi. The girls engaged in hummingbird identification, tree identification, and scooping for salamander eggs with the conservation education managers for Strawberry Plains. The other two days, late fall and spring, were spent at the UM Field Station, where the girls measured Water Velocity, tested pH, and conducted invertebrate sampling with electrofishing and dip net tools. Early in the program, Dr. Scott Knight, the director of the UM Field Station, discussed the purpose of field notebooks, and he shared his own work from over the years. The girls were given their own blank field journals for the program. At the end of each session, we asked the girls to reflect and write about what they had learned and what intrigued them. We asked them to note what they wanted to know more about and think of what information they wanted to research for their final presentation. Between sessions, the girls recorded their thoughts in our online classroom space. On the last spring meeting, the girls were able to participate in an environmental study graduate student poster session in which graduate students presented their proposed research. Using the graduate students’ posters as a model, the girls presented their own proposals to parents and faculty as a culmination of the year’s work together. Ultimately, the reason we developed the program was two-fold: On one level, we wanted to create authentic learning experiences that would lead to student-driven inquiry resulting in more critical thinking and engaged inquiry. We wanted to generate curiosity about the local environment using citizen scientist strategies so that students could apply those same strategies of inquiry to their own immediate ecosystems, i.e. their own backyards. The project’s target is for the students to be eco-agents of change. This program goal developed out of a conversation with my friend Scott Knight, the director of the Field Station, and a meeting with the staff from Strawberry Plains. We discussed that the percentage of women in non-academic environmental science careers has not kept pace with the rising percentage of women in overall STEM careers. In our university’s K-6 Ecology Day Camp, we average more girls than boys attending the program, catching bugs, taking water samples, and looking at snakes. We began to wonder what happens to these girls as they get older. Where is this interruption in the elementary and middle school interest as it connects to college and career? When does the interest wane? Does interest really wane or is it ultimately stifled by peer pressure and socialization? On the second level, we wanted to empower young women in environmental studies by building on the energy of the group. Our idea was that we could motivate young female students during those critical school years by getting them out of a lab or classroom and into the world with environmental field research as they supported each other in scientific discovery. We did a great deal of community building and asking the girls to share thoughts during lunches. Our goal was to help them become eco-friends, to interact as young women who could encourage each other when the peer pressure told them that scientific inquiry involving water, bugs, birds, plants, mud, and sweat was not for girls. We wanted them to embrace the process and even consider it as a career trajectory. At the end of the program, we realized that four days throughout the school year may not have been enough to develop a strong support system for the girls as they are spread out across a large region of the state. However, one teacher noted: “I got to watch girls from all over North Mississippi connect with each other on an academic level as well as one much deeper. The connections this program provided are undeniable and truly unforgettable.” Our cohort may or may not stay together as we move into year two, but our hope is that the shared experiences in the woods, water, and mud will keep the STEM focus in their lives. We discovered that the projects were not as important as the experiences themselves. Inquiry became the most essential and vital part of the work during each hands-on exploration. One young woman was fascinated with the idea of the Wood-Wide-Web while several participants collaborated on a proposal to use electrofishing techniques to survey a fish population for pollution or microplastics in the local water sources. Each new field experience led them to think about another new way of looking at the environment. As one of our teachers noted, “Through our nature hikes, I discovered how deeply connected we as humans actually are to the world around us. It was sadly one of the first times in my life I realized that it is nature, science, and scientific discovery that have shaped and dictated our economy, history, language, and literature; and now, all of the traditional school subjects are connected in my mind.” Connected learning happened for all of us as we got out of the classroom and into the real world. The most powerful lesson from this project may not be what the students learned: rather, the lesson with the biggest impact may be what the teachers learned. Student-driven inquiry differs greatly from a traditional classroom model. Add that idea to the nature of field experiences and teachers realize that learning is no longer directed but supported. For one of our teachers, that left her with an odd feeling of not pulling her weight in the group. Ironically, she contributed the most in terms of content knowledge and making the learning accessible for the students. Supporting student inquiry means that teachers create the frame for student learning to happen and then they have to trust the process. Shifting from a traditional teacher role to a facilitator role means teachers must rely on their own content knowledge and resources while stepping back and letting the students take charge of their own learning. As educators, we have to focus on the journey more than the end result as the exploration is where learning takes place. This year, our adventure led us through woods, creeks, mud, and rain to find new meanings in our experiences together. Our water boots are ready for year two. It sounds like a lot of great learning for the teachers and students happened on your field studies! The lesson for teachers that it's ok to step back and let students' natural curiosity lead is both challenging and freeing. You mention that teachers' role becomes to build the frame for the inquiry, any tips on how to do this effectively?